A few weeks ago my Mom was telling me about some tablets that she used in the past to make ice cream. She told me the name and sent me to look for them. Well, I kept forgetting (I am easily distracted by shiny objects). She finally sent me a pack with the recipe booklet. 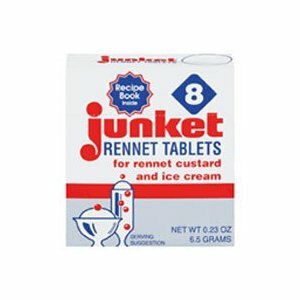 Junket Rennet Tablets - they were popular in the 70s, along with fondue, disco and groovy green, gold and brown decor/clothing. I flipped through the recipe booklet and found an ice cream recipe and went to the store to get my milk and cream. 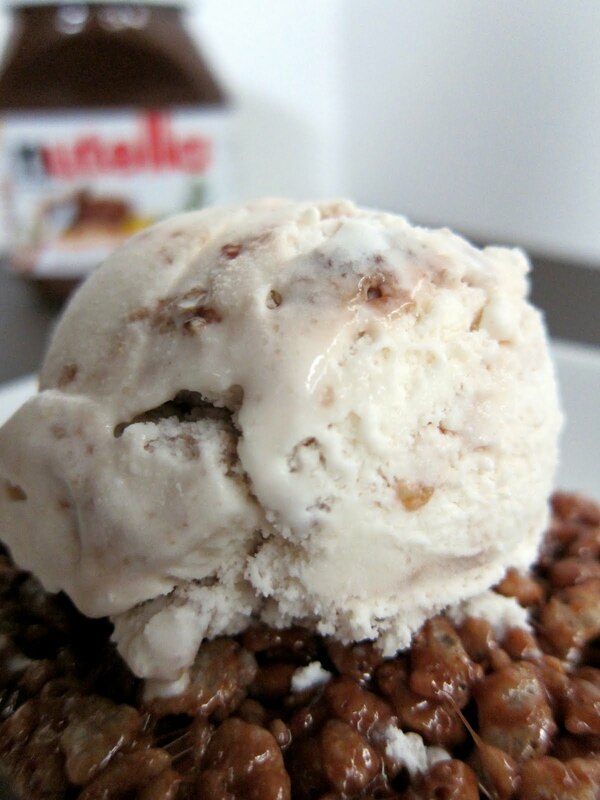 I couldn't just do plain vanilla ice cream, so I mixed in some Nutella Krispie treats! Oh my! My favorite burger joint has tons of fabulous and unique milk shakes. Krispy Kreme, Nutella Smores and Rice Krispie Treat just to name a few. I already made some Krispy Kreme ice cream, so I decided to combine the other two into one ice cream. I made the Nutella Krispies the night before and chopped them into tiny bits to stir into the ice cream after it churned. It was great! I thought it had the perfect amount of chocolate and crunch. In a large pot, melt butter and add marshmallows. Once melted, stir in Nutella. Add Rice Krispies and stir until thourghly combined. Quickly spread into a 9x13 pan lightly sprayed with cooking spray. (I use waxed paper to push the krispies into the pan) Allow to cool completely. Once cool, you will need 2 cups of chopped Krispies to stir into ice cream. Dissolve Rennet Tablet in water by crushing. Set aside. Combine remainign ingredients in saucepan. Heat while stirring to lukewarm (110 degrees). Stir in dissolved Rennet Tablet and quickly pour into glass bowl. Let stand undisturbed for 10 minutes. Pour into freezing conatiner of ice cream maker and follow manufacturers instructions for freezing. Stir in 2 cups of chopped Nutella Krispies. Transfer to container and place in freezer until ready to serve. 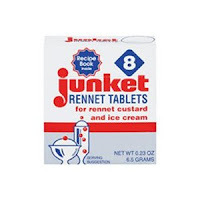 I have never heard of Rennett Tablets and I'm a 70's child! This looks fabulous Steph. I think I remember reading that Rennett is also used in some cheese making. WOW, what an awesome combination! Yummy! That looks delicious and really fun! you sure have a way with ice cream! all of your creations look fantastic.